Whether training for a local 10 km run or the Rio 2016 Olympics, athletes of all shapes, sizes and levels share a common goal: to perform to the best of their ability. Technical expertise and training are the cornerstones of improving athletic performance, but good nutrition is equally crucial for success. Over the last two decades, our understanding of the important role that dietary protein plays in muscle building and recovery has grown vastly. We now know that it is not simply the quantity of protein consumed, but also the quality of that protein and when we consume it that dictates muscle health and function. 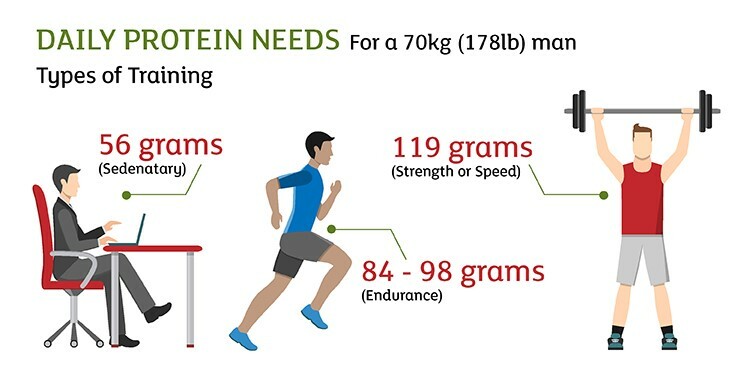 The daily recommended allowance (RDA) for protein is 0.8 grams per kilogram of body weight per day, which translates to 56 g for a 70 kg/178 pound man. The vast majority of people consuming a typical western style diet easily achieve this level. But at Kerry’s recent Scientific Advisory Council Meeting, Professor Stuart Phillips, Director of the Centre for Nutrition, Exercise, and Health Research at McMaster University, warned that RDAs are minimum levels set to prevent deficiency rather than levels that will optimise health. Protein has countless functions in the human body, however it is especially important for the maintenance and recovery of muscle. Muscle health is a critical determinant of athletic performance, so, for athletes, achieving optimal rather than merely adequate protein intake is key. Intense exercise causes the proteins that make up muscle to be broken down. This damage is responsible for muscle soreness and can ultimately reduce strength and function if the proteins are not replenished. Consuming protein in the diet can offset this effect. Eating a high protein meal decreases muscle breakdown and increases muscle repair and synthesis (Moore D et al., 2015). As a result, the American College of Sports Medicine advocates protein intakes higher than the RDA. 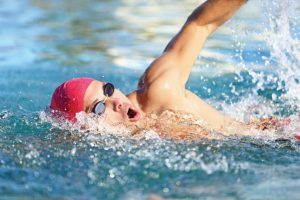 Individuals who take part in endurance sports (runners, cyclists, swimmers) are advised to consume between 1.2 – 1.4 g per kg body weight per day (84-98 g per day for a 70 kg/178 pound man) while for power disciplines (strength or speed) intakes of up to 1.7g per kg body weight per day (119 g/d) are recommended. It’s not just the amount of protein, but also the type of protein in the diet that athletes need to take note of. 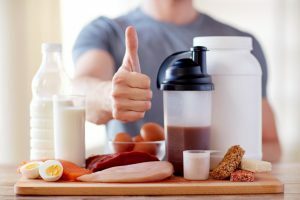 Scientific research shows that simply consuming enough protein will not optimise muscle repair and synthesis because not all types of protein are equally beneficial. In order to utilise the protein we eat, the body breaks it down into basic building blocks, called amino acids. The source of the protein influences our ability to digest it properly and, therefore, the availability of these crucial building blocks. Protein from plants such as vegetables, nuts, seeds, grains, and legumes are not as well digested as protein from animal sources or soy protein. In addition, not all proteins contain all of the amino acids the human body needs. Some amino acids, called essential amino acids, cannot be produced by the human body and must be consumed in the diet. Most plant proteins lack one or more of these essential amino acids, meaning plant sources must be combined in the diet to provide for the body’s needs. Egg, milk and soy proteins are highly digestible and contain all of the essential amino acids, meaning they are considered the highest quality proteins for humans. Recent scientific research has allowed us to refine this list even further for athletes because when it comes to building muscle, one specific amino acid, leucine, plays a critical role (Layman D et al., 2015). Leucine acts like a molecular switch that turns on the body’s machinery for manufacturing muscle. Whey protein contains more leucine than any other source of protein and clinical studies have shown that whey stimulates muscle synthesis more effectively than other high quality proteins, especially when consumed after exercise. As a result, whey protein recovery supplements have become extremely popular. Focusing on post-exercise whey supplementation is only part of a bigger picture. Optimal muscle repair and synthesis will not be achieved simply by drinking a protein shake after a workout. Frequent training is required to improve performance. As a result, muscle breakdown, repair and synthesis becomes an ongoing process and regular intake of high quality protein is needed. We now know that consuming around 20-30g of protein can “switch on” muscle protein synthesis, but this effect plateaus when more protein is consumed (Moore D et al., 2015). This means that consuming larger amounts of protein at that same meal offers no additional benefit. For this reason, spreading protein intake throughout the day, such that 20-30g of high quality protein is consumed at breakfast, lunch and dinner, is more beneficial. This type of meal pattern will lead to more muscle synthesis and less muscle breakdown throughout the day. A recent study carried out by researchers at Maastricht University in the Netherlands suggests that one additional snack before sleeping may further optimise muscle synthesis (Snijders T et al., 2015). Sleep is crucial, not only for athletic performance but also for general health and wellness. The hours we spend sleeping, however, constitute a period of fasting and this leaves the body vulnerable to muscle breakdown. The researchers found that consuming 20-30g of high quality protein before bed minimised muscle break down and promoted muscle synthesis during sleep, meaning that a protein packed bedtime snack could be beneficial. Regulations for sports foods can differ between countries. Find out more details on our Regulations for Sports Foods page. What does all of this mean in terms of diet? Thanks to our improved understanding of the way in which dietary protein affects muscle health, we can now define not just the quantity of protein, but also the quality and timing of intake needed to optimise muscle recovery and function, and ultimately, performance. 2.Quality: Protein from animal sources is easier to digest and better quality than most plant proteins. Choose high quality sources such as eggs, lean meats, milk, cheese, yogurt and soy products. If you are a vegetarian, combine plant sources of protein to ensure your body gets all of the essential amino acids. Eimear began her career as a Clinical Dietitian after which she spent four years working in research at Trinity College Dublin’s Institute of Molecular Medicine and the National Children’s Research Centre. In her time working as a nutrition scientist in the food and beverage industry, Eimear helped develop nutrition solutions targeted at specific life stages and need states as well as coordinated nutrition research. Layman, D.K., Anthony, T.G., Rasmussen, B.B., Adams, S.H., Lynch, C.J., Brinkworth, G.D., and Davis, T.A. 2015. Defining meal requirements for protein to optimize metabolic roles of amino acids. Am. J. Clin. Nutr. 101(6): 1330S–1338S. Moore, D.R., Churchward-Venne, T.A., Witard, O., Breen, L., Burd, N.A., Tipton, K.D., and Phillips, S.M. 2015. Protein ingestion to stimulate myofibrillar protein synthesis requires greater relative protein intakes in healthy older versus younger men. J. Gerontol. A Biol. Sci. Med. Sci. 70(1): 57–62. Snijders, T., Res, P.T., Smeets, J.S., van Vliet, S., van Kranenburg, J., Maase, K., et al. 2015. Protein ingestion before sleep increases muscle mass and strength gains during prolonged resistance-type exercise training in healthy young men. J. Nutr. 145(6): 1178–1184.